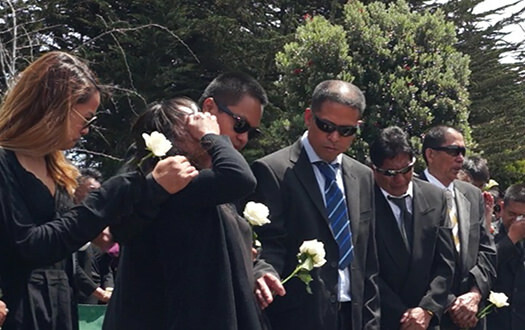 The Guillermo family buried its dead last week. In a bit of justice for my 26-year-old cousin Stephen, thank goodness I checked my email during the funeral. Dr. Sophie Clavier, his advisor at San Francisco State, had informed me the school would grant his degree in International Relations posthumously. But academic justice is one thing. We still had to deal with the mysterious reality of the law. When the victim of a shooting death is a family member and your attorney is the DA, it can be strange. The DA is your friend? He should be–if he’s your attorney, fighting for you. Your tax dollars at work, right? So in that spirit of openness and transparency, the family welcomed Assistant District Attorney David Merin into our San Francisco living room. It was a 30-minute dialogue to help us understand the process. And it did give some hope to family members of Stephen Guillermo, though it all seemed strangely surreal to me. Merin said he’s still looking into the case. For the family members who have been kept in the dark, that’s something. “I’ve got an open mind,” Merin said, as he acknowledged getting all the files on Tuesday and even briefing his boss, District Attorney George Gascon, about the case that morning of our meeting. “We saw all of you out there too,” he added, indicating that the family’s vigils at the Hall of Justice and news media presence have been noticed. Merin said he had no doubt that Amisi Kachepa, the suspect previously held, was Stephen’s killer, in the early morning shooting in Kachepa’s apartment on May 3. But Merin said he was still evaluating the evidence to see if there would be enough to charge him. First sign that we’ve entered the surreal. There’s a killer and the DA can’t charge him? Merin said he’d like to see the Medical Examiner’s report to get more insight, and that could take some time. The family really welcomes that. We want the DA to go over everything for as long as he needs. And Merin indicated he’d like to hear from more people who might know about the incident or the people connected to it. Those with information to share about the case and the people involved are asked to call David Merin at the SF DA’s office at 415.553.1751. Merin said the prime suspect Kachepa had been relocated and is no longer at the apartment building where Guillermo family members still live. Merin also said there were no travel restrictions on Kachepa and that he was free to continue to arm himself. Police Chief Greg Suhr had previously told the family the same thing and said the weapon used to kill Stephen was being held as evidence. The meeting then ended. Merin had his own family business to attend to. His daughter’s birthday dinner. Merin clearly doesn’t want specific details of the investigation to get out. But it’s also clear to me the “Castle doctrine” in California remains his biggest challenge. In previous posts, I’ve asked if there was no break-in and no intrusion, how could the Castle doctrine apply? Castle is based on the belief that one has a right to defend one’s castle and use deadly force if there’s an intruder under a reasonable threat of danger. Nothing the DA shared with the family suggests the danger was real. Not with unarmed, non-violent Stephen, half the size of his shooter. You shouldn’t be killed for being let into the wrong apartment. But Castle puts us in another world. It takes logic back to the Wild West. It’s a century of case law that simplifies things to the point where you can take the law into your own hands and use deadly force if you sense an imminent threat in your home. Ask law-abiding people on the street about their right to Castle and you’ll get a blank stare. It’s the law, not a privilege of paying high rents in San Francisco. Yet, you’ll find it’s only gun owners know Castle in order to know exactly when and how they can shoot to kill legally. That’s how senseless the gun laws are. Castle was intended to protect the home. It’s become more about protecting gun zealots so they can use their guns and shoot to kill with confidence. Know the law, and you can get away with murder. Make an innocent mistake and walk into the wrong place, and you can pay with your life. The family hopes the DA will find enough to charge Stephen’s killer. While Castle allows the presumption of a reasonable threat, it’s possible that presumption could be overcome. I hope the DA will have the courage and political will to continue to fight for us and to let a jury decide what is right for the City and County of San Francisco. DAs, judges, and politicians all fear voters. But without even trying to test the law, inaction leaves innocent people potentially exposed–to gun owners, who misuse their guns and then hide behind Castle. There was one hopeful remark from Merin. I asked him if use of a gun against Stephen seemed reasonable in this situation. Understatement of the year? Sure, but if that’s really his feeling, there could be a sliver of hope as the investigation continues for #justiceforstephen.